Pinellas County Schools is helping parents and students stay connected to their school with the Pinellas County Schools App. 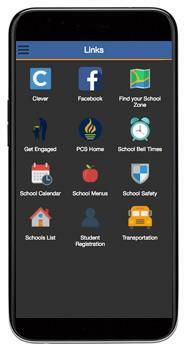 The app, developed by Focus, helps families access student information on their cellphones and mobile devices. Parents and students can still use the Focus website on desktop computers, but the app is designed to work better with mobile devices. Parents and students receive real-time notifications of grades, attendance, upcoming assignments and test scores. App users are also able to view school district news, Facebook posts and school messages. Links to the student calendar, school menus, school bell times, family engagement opportunities and transportation info are also available. The app can be downloaded from the Google Play Store or the Apple App Store. Use your parent ID and password. For logon issues, please contact the front office staff at your school. To request a new user ID and password, please visit your school or the Student Assignment Office with a valid photo ID. The “Planner” tab displays upcoming assignments. Swipe left in the App to view news feeds. Swipe left again to access web links.